Even if it's purely self ego which brings you to buying (or saving) a Battery Hen, it doesn't matter. 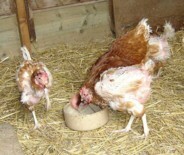 At 60 - 70 weeks old, the hen would be in pet food or chicken pies. By a little tender loving care, you'll get eggs and the hen get's a few extra years in the process. However, if you're after making money from eggs, this is probably not your answer, so a mix of chickens is usually the best way. They encourage each other and you more than likely not know for certain which chickens are laying or not any way ! You'll pay between about 50p and £3 each for them. 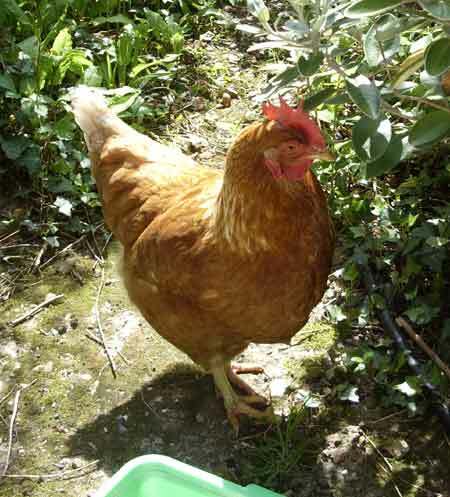 Most rescued hens are now obtained from Charities such as Hen Rehomers ot the Battery Hen Welfare Trust. If you buy direct from a Battery Farm, the owner / manager will go into the shed and select them for you. Hence you won't get the one's who really show up the real meaning of battery farming. The appearance will be apparent. Up to two thirds of the feathers will not be there and red scars more than likely from the continious squabbling inside the cages. After all, what else have they got to do 5 to a cage and less than one square foot each. The beaks will be cut (well burnt off actually), usually only the top one. This was to stop too much injury to there cell mates. The legs will be lumpy and bumpy and, although not 'documented', I've found the necks are often longer which I can only imagine is from the reaching out the cage to get at the food. When you get them home and you put them in the shed (not advisable for them to go straight outside) you'll be surprised at two things; first how some just don't move atall because they don't know how to, yet secondly, some go skipping around in circles but too often end up falling over themselves. It is rare they will get up on a perch for quite some while. They will be quite happy snuggled up to each other in a corner. Remember that although they come from a horrible place, they have been fed well, it's been the same hours in every day for 50 odd weeks and it was probably warm. There's no problem with the feeding. The food has been rolling past them all hours of the day, so as soon as you put some in - it's gone ! For egg's, expect a few in the first couple of days, then none for quite a while. They take time to adapt. Also, you'll find they lay 'where they are at the time', so search the shed and pen all the time. You'll never know where you'll find one. Some of them will make their way outside very quickly. It's surprising how soon they learn the art of flight, so make sure all exits are guarded and one of their wings are clipped. Sad to say, I've learnt this the hard way on more than one occasion where Mr. Fox has paid a lunchtime visit. The older residents will guide them back in at dusk. In about 36 battery hens, I've only found two outside after dark. They soon home in on their shed. Still expect some punch up's. I always see them as coming in with urban street cred !! They'll have a go at other chickens quite readily. But this settles very quickly. There's always an olden who's going to put them in their place in the pecking order ! As I said earlier, I don't think they will lay as well as other free range, outdoor birds. They have been overdosed with very high protein food, put in artificial mid summers day all their life and after all, why do the battery farmers get rid of them at 70 weeks - because they're 'egged out'. It's like you're giving them a second / new life, and after some time I'm convinced they change to, excuse the expression, normal birds and will produce well for you. I'm convinced you notice the difference in flavour the more they settle in. 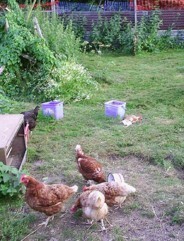 In the last two years of having ex-battery hens, I've kept my flock about 50 / 50 'thoroughbred' and 'battery'. 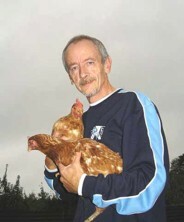 I've averaged about 14 chickens at any one time and I couldn't tell you exactly how many eggs I get from the birds To be honest, I don't want to know, the fact is I get eggs and have some great Chickens, whatever type..
pay for the chicken feed and still have a pint of Shepherd Neames Fine Ale on them. Could they pay you back in any better way ! !